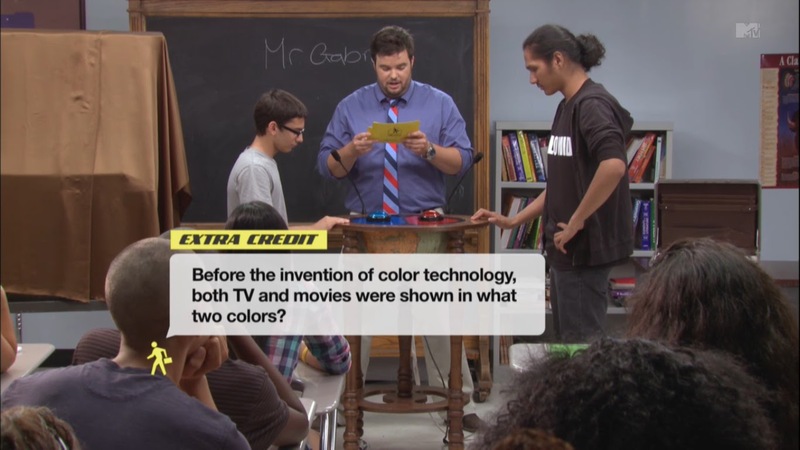 Premise- Host Jon Gabrus surprises a group of students in a classroom in each episode by engaging them in a trivia game show. The classroom begins with twenty students that get paired down after each round. A total of four rounds are played through the show. In the first round called “Things You Should Know”, contestants are asked trivia questions that focus on academic subjects such as math, history, and literate. Two questions in this round are designated as “Extra Credit” questions. The two contestants who answer the Extra Credit questions correctly, will face-off against each other at the round to play for the Extra Credit bonus prize. In the second round called “Things You Do Know”, the remaining ten contestants are asked trivia questions that focus on pop-culture. In the third round called “What You Do”, the remaining five contestants will compete in a physical challenge and the winner moves on to the final round to face-off against one of the other four contestants chosen by the consensus of the fifteen eliminated contestants. In the fourth and final round called “Things You Think”, the solo contestant and People’s Choice contestant will be asked five survey questions, in which the students are polled in advance, and the two contestants have to try to guess the most popular answer. The contestant who is the closest to the top answer for each question wins one point. The first contestant to get three points wins $5,000 in cash. If the solo contestant wins, they keep the $5,000 for his/herself. If the People’s Choice contestant wins, the $5,000 is split among the 19 other students, including the People’s Choice contestant. I have always been impressed with most MTV game shows, such as Remote Control and Silent Library, and The Substitute is no different. The Substitute is a good game show with a solid format, appropriate difficulty level for the questions, good gameplay, and a decent host. This show kind of has a Cash Cab feel to it, in terms of the host surprising the contestants with the news that they are on a game show. I also like that the Extra Credit bonus prizes at stake in the first round are decent and cool prizes to win, unlike the cheap prizes that are given away on Lingo, like a coffee maker or an IPod Shuffle. As for host John Gabrus, he is a good and funny host who sticks to script and keeps the show flowing at a consistent pace, even though some of his jokes are corny and sometimes just not funny. I have noticed this show that rips off Family Feud’s Fast Money round in The Substitute’s final round, which is like a two-player version of Fast Money. On a quick side note, some of the students competing in this show look more like adults, rather than high school students. Overall, The Substitute is a simple game show, but a good one with a decent grand prize of $5,000 in cash. The show could have done more, like show which school is going to be shown on the show and which class was going to be surprised that day. I have also noticed that the first few seconds of the show that include the students being “surprised” with the news that they are on a game show seems staged and set up. Other than that, this is a good, moderately rapid-fire quiz show to watch. Watch The Substitute Weekdays at 4:30pm EST on MTV!